armed force, Idris Alkali, went missing. The armed force officer was said to have gone out in Abuja on Monday 3/09/2018 for Bauchi where he has farm however was mysteriously no where to be found as his telephone lines were turned off. The last individual who talked with him was his better half. It was suspected that Major General Alkali who was travelling in his car was kidnapped by unknown hoodlums, after he took a road his wife advised him not to take . According to journalist Bello Lukman who works with Unity Fm Jos, Major General Idris Alkali who retired from service, weeks before going missing, was reportedly kidnapped. The General was found dead in a pool of his blood along the University of Jos teaching hospital's permanent site yesterday. According to reports, the deceased's car was found alongside various other automobiles, ranging from motorcycles to tricycles otherwise known as Keke. 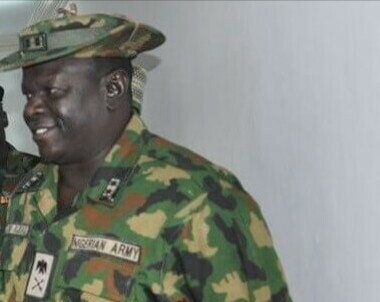 It is reported that General Alkali who is known for his simplicity – does not normally involve Army personnel or materials in relation to his personal businesses, hence he is believed to have travelled alone before his abduction and murder.